Only talent and nominees that stay at The Four Seasons Hotel will receive these amazing gifts in the comfort of their hotel room. BEVERLY HILLS, CA, UNITED STATES, September 17, 2018 /EINPresswire.com/ — Hollywood Swag Bag (www.hollywoodswagbag.com) will be providing gifts for the nominees and talent staying at The Four Seasons Hotel at Beverly Hills in honor of Emmy Weekend. The talent will receive their luxuries in the comfort of their own hotel rooms. The swag bag is valued at $5,000.00 this year includes an assortment of cosmetics, gift vouchers, books and more from Australia as well as local U.S. brands. Past recipients of Hollywood Swag Bag's Four Seasons Gift Bags include Oprah Winfrey, Brie Larson, Jessica Lange, Viola Davis, Ricky Gervais, Jimmy Kimmel and the cast of Game of Thrones. 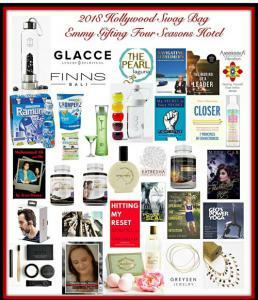 Gifting participants for the 2018 Gift Bag include: Greysen Jewelry Custom Pieces, Gift Vouchers to Finn's Beach Club in Bali, Glacce Crystal Elixir Luxury Spiritual Water Bottle, Perla Natural Teeth Whitening, Katresha Pure Skincare Divine Facial Oil, Geo’s Power Yoga CD, The Pearl Laguna Welllness Retreat, Aftershokz Trekz Air Open Air Wireless Headphones, an assortment of Seasnax Seaweed Snacks, Carolyn Cranwell's book Navigating Alzheimer's along with a gift voucher for her services, Kerrie Denton's book My Secret is Your Secret, Nely Cab's Creatura Book Marker of Hope Book 3, Sangaria USA Ramune Soda’s, BeTini Spirits in assorted flavors, Peter Charleston’s Closer 7 Principals of Connectedness, Diva by Cindy Divalicious Body Lotion, Artisfactions Visual Communications by Tracy Saunders, Julie Lewin’s books The Making of a Leader and AreekeerA™ Vibration | Healing Yourself From Within, Drinkfinity Vessel and pods, Titanium Living supplements for joints, hair and memory, The Unhappy Smile by Tracey Horton, Hitting My Reset by Lisa Gallate, Romance Author Anne Elizabeth and her book The Power of a Seal, Jodi Livon “The Happy Medium” Speaking the Language of Intuition, Jean Dancy’s Muhummad Ali and Me, and Heather Longrippo’s Mom Bomb Bath Bombs for a cause. Follow Hollywood Swag Bag Twitter (@swaggivesback), and Instagram (@hollywoodswagbag). Direct press inquiries to lisagalbianchi@gmail[dot]com. Hollywood Swag Bag www.hollywoodswagbag.com in conjunction with www.hollywoodbaskets.com is a luxury gifting company that represents various brands from US and worldwide to provide gifts to celebrities through luxury hotels in Los Angeles and New York. Hollywood Swag Bag is in no way associated with The Emmy’s, The Academy of Motion Pictures Arts & Sciences, The Hollywood Foreign Press Association, or The Academy of Television Arts & Sciences.